2018 Police-involved Shootings | Chicago Murder, Crime & Mayhem | HeyJackass! 2009-2012 stats account for CPD incidents only. 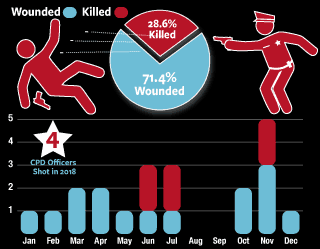 2013-2018 may include other police forces within Chicago, such as the Illinois State Police, Cook County Sheriff, various 3 lettered state/federal agencies or university police forces. Historical data pulled from Independent Police Review Authority Civilian Office of Police Accountability (COPAcabana).